1. Data Specialist – Teachers these days are forced to become data specialists because all they hear about daily is data, data, data, data, data (inserts eye roll). Whether it’s averaging grades or figuring what percentage of students grasped a concept, you cannot go very long in the profession without gathering and analyzing data. In the recent years there has been a huge emphasis on being data driven. Some districts have even created a position to help collect schoolwide data, but teachers are ultimately still the ones who must take the results and plan next steps. Educator language is another language within itself. 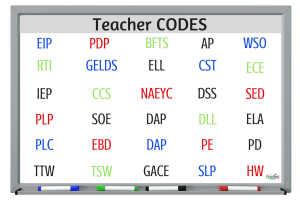 There are tons of codes that you are required to know and be able to use and understand from day to day. Although some phrases are specific to counties and programs here are a few of the frequently used ones. Test yourself and see which ones you can readily decode. The hardest part about learning them is not having a glossary or guide. You just have to pick them up as you go (talk about full immersion…geez). The third type of decoding involves figuring out and trying to use children’s native languages, when it differs from yours. As classrooms become more diverse, children come to school with native languages that the teacher may not understand but it is STILL expected that teaching and learning take place despite this barrier and sometimes with little support. 3. Singer/Dancer – Becoming a singer and/or dancer is something that teachers at some point during the year will become and the younger the age group you teach, the more frequent. Songs and dances grab student’s attention, so great teachers use both to enhance their lessons which usually requires them to participate or lead it! The good thing about being a singer or dancer in your class doesn’t necessarily require you to be good at it! 4. Social Worker – Social worker helps people cope with problems in their everyday life. Clinical social workers diagnose and treat mental, behavioral and emotional issues. Teachers spend a great deal of time helping students unpack problems that spill over into the classroom from their home life. It can be as deep as abuse, or as simple as an attitude that a child comes in with over an undesirable breakfast option (I called this the – I didn’t get the waffles I wanted meltdown), but nevertheless teachers have to help children cope. Even if children come in without any visible issues from home, there are problems that happen within the school day. You’d be surprised how students take friendship drama and their social life to heart. Aside from helping them cope with the things in their life so they can be ready to learn, teachers are often required to document visible behavioral occurrences in order to help with the diagnosis process if there are serious issues taking place. While a diagnosis is being made and treatment is being decided on, guess who has to figure out the “in the meantime” treatment…you guessed it. The teacher. 5. Coach – Teachers are like coaches because they prepare students to perform. As much as every teacher I know disagrees with teaching to the test, children are put under so much pressure to be on grade level and perform according to assessment guidelines and scores. A teacher must know how students are expected to perform and provide repetitious practice and coaching sessions to get there. 6. Parent – Although some may disagree, a good teacher acts in the role of a parent with their students. Just as parents feed, provide, protect, discipline, reward and love their child, a teacher does the same, while students are in their care. Every teacher that I know has a stash of food somewhere for the child who didn’t get breakfast or who didn’t have a snack. Many teachers buy snacks and edible treats for their class to enjoy. Teachers provide for students in some way during the year. They often provide countless school supplies that are purchased for children who come without, or take care of the replenishing of tissues and hanitizer 😉 as the year end approaches, but I’ve never known a teacher who didn’t provide something for their students. After spending long days together, 5 days a week, teachers grow protective over their children like parents. They want the best sub if they are ever out and they want the best for them in all areas. Like parenting, discipline and rewards come through teaching children how to conduct themselves and what is acceptable in the classroom. Yes there are many parents that send their child(ren) to school knowing how to behave, but teachers still have to teach how to behave as a part of the class culture. A large part of teaching is helping children to develop in making good choices and rewards are often used to encourage this. A teacher loves their students like a parent does and it is evident to the students and the teacher’s friends and family. They often find themselves saying, “my kids” as if they are their own personal children. Children also love their teachers like another parent. Their love can run so deep that students will convince their parents that they are wrong if they say something that contradicts what their teacher said! Lastly, you can almost guarantee, that at some point in their career, at least one student will call them mom or dad on accident – and at that moment they have officially taken on the co-parent role! 7. Behavioral Specialist – Ask any teacher you know and they will tell you that they have had to deal with behaviors in the past or are currently dealing with it. The severity of the behaviors range with each age, from child to child and from year to year. Although teacher preparation courses include a behavior management component, a teacher is hardly EVER prepared to deal with the extreme behaviors that they will encounter at some point. Nevertheless, a teacher has to find ways to prevent, deescalate, and manage behaviors if they hope to teach ANYTHING that they have planned. The lack of support teachers receive around negative behaviors and their survival mode instinct, turns them into behavior specialist. Through struggling with different types of behaviors throughout the years, teachers become behavior specialists and learn their own tactics to deal with what they are faced with. 8. Teacher – Aside from performing all of these mentioned roles, a teacher finally gets be a teacher. Once data is analyzed, languages are decoded, singing and dancing is implemented, personal problems are dealt with, coaching sessions are planned, co-parent duties are fulfilled and behaviors are under control, then they can finally do what they enjoy – teach children how to be all around successful little people! So if you ever find yourself thinking that teachers JUST teach – think again! It’s no wonder they are so exhausted every Friday and need their breaks and summer vacation! I love this! All of these items stand true for teachers! This is very well written and has detailed facts about the life of a teacher. I don’t think that you missed anything! I do wish that “teacher breaks” such as all paid holidays, snow days, and any other days are needed as well just to be able to rejuvenate! You need the breaks in order to step away from your roll as teacher and assume the many other rolls that we manage in our daily lives! Hi Habibah! You’re welcome! Thanks for your feedback! 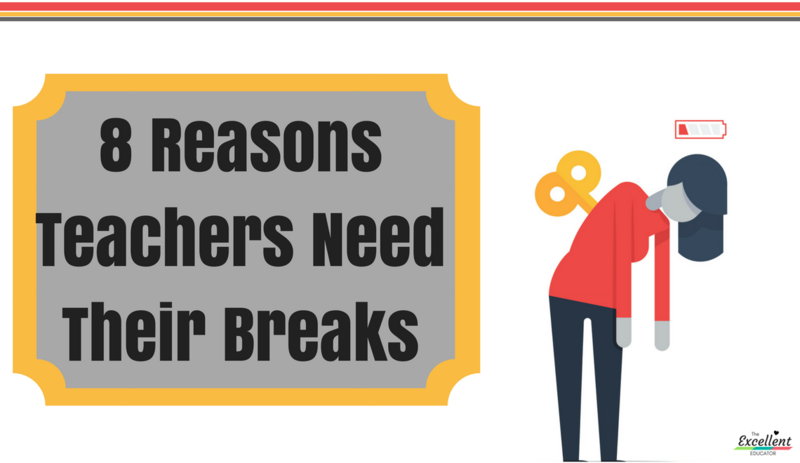 I too wish that teachers got more “teacher breaks” to be able to rejuvenate and handle all the other things that often get neglected! Thanks for taking time to read this and for taking time to comment. I hope you will find other useful things on this site! The awareness you bring to even non teachers is awesome. I truly wish every parent,student,pupil,administrator,lawyer,doctor,preacher, etc etc etc could receive this website. It would enhance the entire world. To you Shakara L. Hill THE EXCELLANT EDUCATOR !!!!!!! Keep on answering to your CALLING. Eyes have not seen, nor ears have not heard, the impact you are making in the educational society or the entire human race with your dedication. Being a senior citizen you make me want to go back to kindergarden or even pre-school just to be in your class. KEEP UP THE GOOD WORK !!!!!! Thank you, thank you, thank you Hezekiah! I am humbled by your comment and I am pleased to know the impact of the content I put out!